In Wenders’ student short Alabama (2000 Light Years) we first see what will become a hallmark in feature after feature: the world as viewed through the windshield of a moving car. We’ve seen many variations of this image (through a car side window, through the window of a train or a plane) but it’s this first image that is key to Wenders’ works, which puts us in the drivers seat, so to speak. Wenders makes films about travelers, people on the move, and he continually returns to the road film: Alice in the Cities, Wrong Move, Kings of the Road, Paris Texas, and Until the End of the World. In other films, travel becomes a central element of the narrative: The Goalie’s Anxiety at the Penalty Kick, The American Friend, The State of Things, Lisbon Story, and of course the journeys from heaven to earth in Wings of Desire and Faraway, So Close! His world is a landscape of winding country roads through fields and forests, city streets and urban cityscapes, railroad tracks and speeding trains, coffee shops, hotels, jukeboxes, photo booths and other roadside attractions. The road serves as both an escape and a way back, the route for escape from responsibility, the winding path back to self. From the self exiled wanderer to the determined traveler, the road ultimately becomes a pathway to (or the possibility of) grace. Winner of the Palme D’Or at the 1984 Cannes Film Festival, Paris, Texas (Criterion) was not Wim Wenders’ first American film—that would be Hammett (1982), which proved to be a dispiriting experience when producer Francis Ford Coppola decided to step in and re-edit Wenders’ vision to something more commercial (so much for the creative freedom he promised filmmakers)—but it is the first American film where Wenders carved his own vision into the American landscape (both physical and cinematic). Just two years after the Hammett debacle, he returned to the U.S. on his own terms, with a story he developed with Sam Shepard and financial backing from Europe that gave him the freedom to make his own film. Paris, Texas (a name that evokes the collision of and contrast between Europe and America) is a road movie, a drama of reconciliation and redemption, a modern western and an emotional odyssey of epic simplicity and emotional integrity set against an America both mythic (the stunning vistas of the Texas border desert are as primal as John Ford’s Monument Valley landscapes) and modern (from the lonely roadside motels and neon totems to the view down on Los Angeles from the hilltop family home). 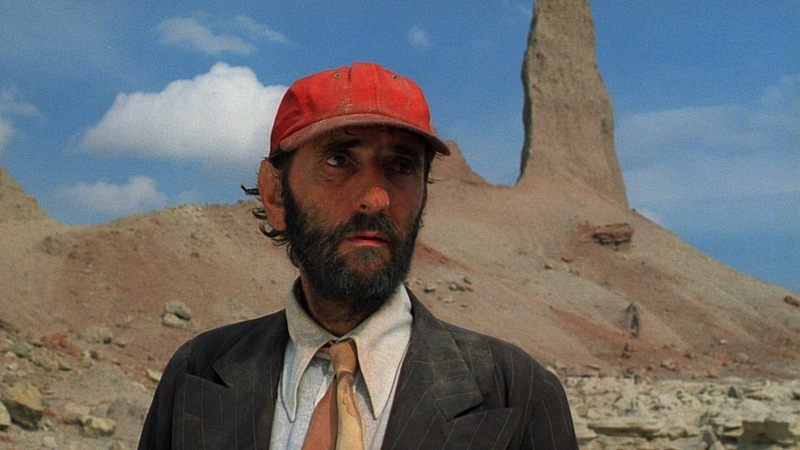 Harry Dean Stanton (in his first and, to the best of my knowledge, only leading role to date) is Travis, a man who walks out of the desert and into civilization, parched and weak and mute but driven by purpose, even if it’s beyond his understanding at that point. Dean Stockwell is his brother Walt, who flies from Los Angeles to Southern Texas and drives him back, bringing Travis out of his almost catatonic, pre-verbal state as the journey brings him out of the wilderness and back to family, notably the son (Hunter Carson) he left behind four years before. Wenders and Shepard prefer spare dialogue that suggests more than it explains, letting the performances fill in the blanks and the images frame the drama. Longtime Wenders collaborator Robby Muller films the deserts and highways of the American southwest with a reverence for the primal beauty and the spare, expansive, seemingly unending landscape. Stanton looks carved from the same wind-scoured stone and sand when he emerges from the desert and Muller and Wenders slowly soften and humanize him as he tentatively but sincerely interacts with his family and returns to society, only to leave on a quest with the son he has just reconnected with. Nastassja Kinski is Jane, the young wife and mother first seen in the home movies that Walt shows one night, and it’s like that image of the happy family captured in warm, blurry super8 footage becomes his grail: he has to repair the broken family that, we are to learn, he himself destroyed.